In this comic-book film-noir RPG, you will play ordinary individuals with legendary powers and hit the streets of a haunted modern-day city in search for answers. With a simple but powerful narrative game system and unique character motivation and evolution mechanics, City of Mist will let you experience just what happens when everyday life on the streets awakens to unfathomable mythical forces from within. 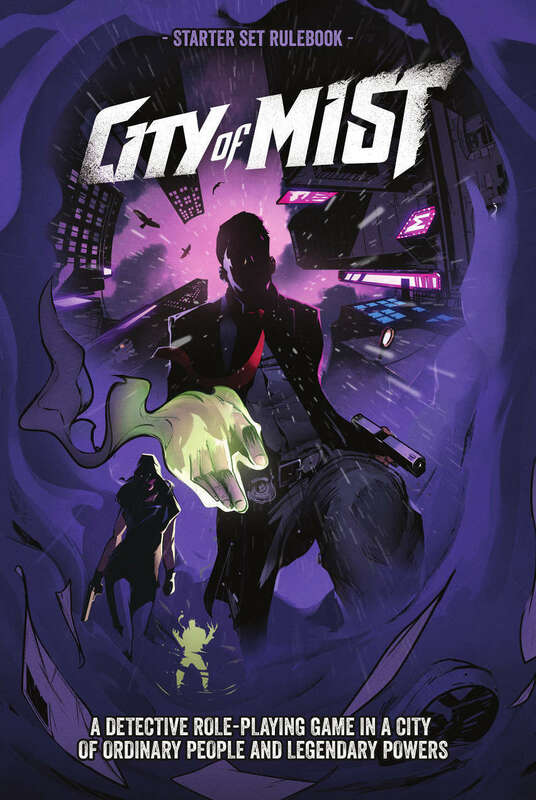 City of Mist is a role-playing game of film-noir investigation and super-powered action. It is set in a modern metropolis rife with crime, conspiracies, and mysteries. The protagonists are Gateways, ordinary people who became the living embodiment of a legend, their Mythos. While your Gateways may seek to strike a balance between the mysterious nature of their Mythos and their mortal aspirations, the powers within them always threaten to tear their lives apart. They have unwittingly become a part of a secret world of clashing stories, and soon other legends will come looking for them with demands. Rich character motivations built around compelling Mysteries and Identities. Follow your characters’ themes to gain their benefits and evolve them or go against them to discover new aspects with a unique non-linear character evolution system. Know no limits for powers, abilities, traits, gear, or allies. Everything in City of Mist is described by free text tags, so you can create exactly the character you want. Full-on narrative engine, with an edge. Every action you take in the game is based on the interpretation of your tags, using moves to deliver dramatic outcomes that drive the story forward. Status spectrums, a new system of ‘narrative damage.’ You can use descriptors to create any imaginable setback or advantage so that every action in the fiction, in and out of combat, can have lasting gameplay implications. My copy has 87 pages (downloaded 5/5/17). Just reDL'ed and same. Folder with 2 sample cases also. Try downloading again, just to make certain it's a good download package, and if it's not, then you can get the separate files via that link above. And do try again; it's an absolutely awesome product, and I'm very glad I helped get it funded!